I have been lax in my commitment to the blog. I have been meaning to write but I was waylaid by other stuff. Like obsessing over the paint scheme for the entry. Actually it wasn't so much the paint scheme as the thought of taping off all of the molding. Now that it's done its schweeet and I am motivated to finish the living room. I am done with the prep, always the hardest part. Priming is scheduled for this weekend. Now I just have to obsess over the color scheme for it. 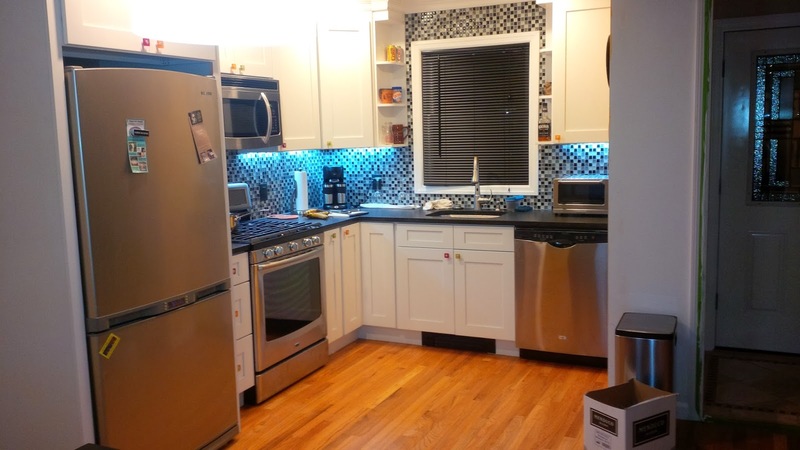 The last time I wrote about the house I was waiting for my kitchen cabinet situation to be straightened out. It has been fixed and my kitchen is gorgeous. Sometimes I stand and stare at it in amazed wonder that it really looks as good as I had planned. Here is a picture. My favorite appliance is the dishwasher. I haven't had one in 8 years and it is a joy to have one again. Not having a dishwasher limited what I would cook. I didn't want to spend more time cleaning than cooking. Now I don't have to. It will also allow me to take advantage of my new gas range. I love it too but not quite as much as the dishwasher. I had a poker game a month back and it did a great job of heating the appetizers. 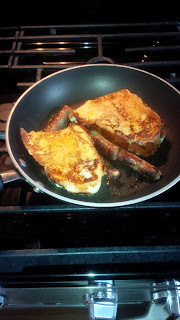 It also cooks a mean French toast with sausage. It struck me as I was preparing to obsess over the living room that I bought this place almost a year ago. A lot has happened since then and I am very pleased with the results. Both with the house and with life in general. Coincidence? Maybe, maybe not. But I can't dismiss the connection. My decisions have been paying dividends and my disposition is much better. I have also been eating more fiber so that may have something to do with it too. That's all for now about the house but there is so much that has happened I am going to be posting again soon.